Dinnertime around here is interesting, I’ll admit. Why’s that? Well, for newcomers, the scoop is this: I’m a vegetarian, and my husband is a meat-eater. Oftentimes, one of us will compromise. He’ll get a big hunk of meat and I’ll eat a hearty side salad for dinner. Or I’ll whip up something vegan for the both of us – no animal products in sight. The very best dinners around here, though, are of the one-dish-two-ways variety – the recipe generally starts out as vegetarian or vegan, then a meat add-in satisfies the resident carnivore too. Of course, adding a picky kiddo to the mix changed things up for us too. I’d be lying if I didn’t say I often find myself making one dish, three ways. Or two dishes, three ways. Or three dishes period. Yeah … we’re a work in progress. 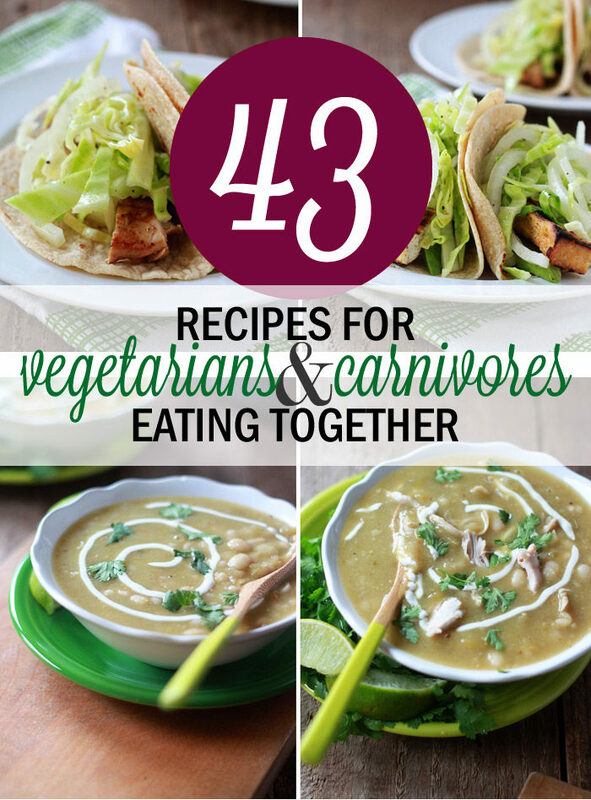 But today, I’m focusing on recipes that are made for vegetarians and carnivores living together. If you’re a family out there like ours, have faith! Believe it or not, there really are tons of options for vegetarians and meat-eaters living together, and these recipes are proof! Cheesy Baked Tortellini (with optional ground beef) – I love using individual casserole dishes to serve this up. Having different color dishes helps us tell them apart. Tortellini with Butternut Squash, Mushrooms, and Gruyere (with optional sausage) – This is a great, easy recipe that also works well for entertaining. 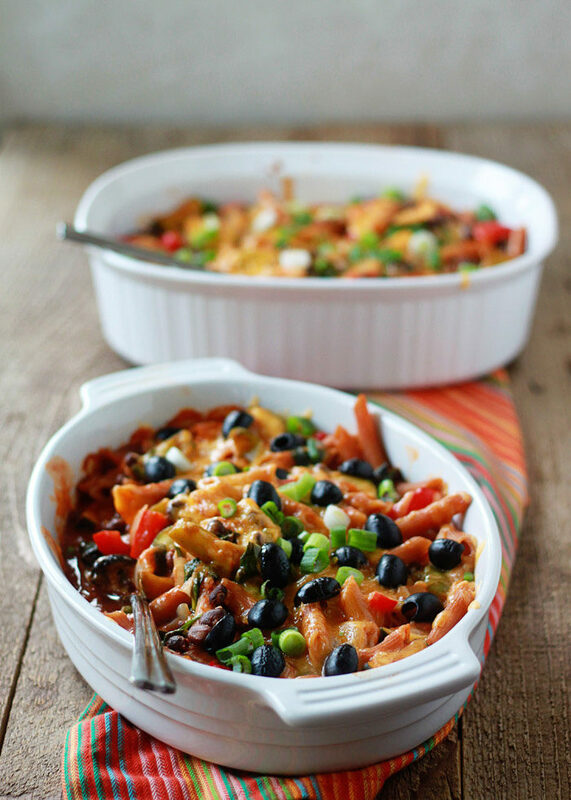 Veggie-Filled Enchilada Pasta Casserole (with optional ground beef) – a dinnertime staple for vegetarians and meat-eaters alike. Ravioli Lasagna – use a meaty ravioli for the carnivores and a meatless one for vegetarians. Done! Lightening-Fast Cheesy Three-Pepper Ravioli with Italian Sausage from Two Healthy Kitchens – The veggie-loaded skillet and delicious ravioli make for the perfect dish. Just cook up the sausage in a separate skillet for the meat-eaters’ versions. Easy peasy! Buffalo Chicken Pasta Salad from Snappy Gourmet – Just leave the chicken out of some or all of this one and you still have veggies and flavor to spare. Love the creativity! Creamy Spinach Tomato Tortellini from Cooking Classy – This recipe starts out vegetarian. Just add some cooked chicken or sausage for the meat-eaters and everyone’s ga-ga! Chili is one of my favorite dinners for several reasons. Delicious? Check. Easy? Check. Simple to customize for vegetarians and meat-eaters? Check check check! So I’ve published several chili recipes here on Kitchen Treaty – each one seems to be a new favorite. I can’t help it! 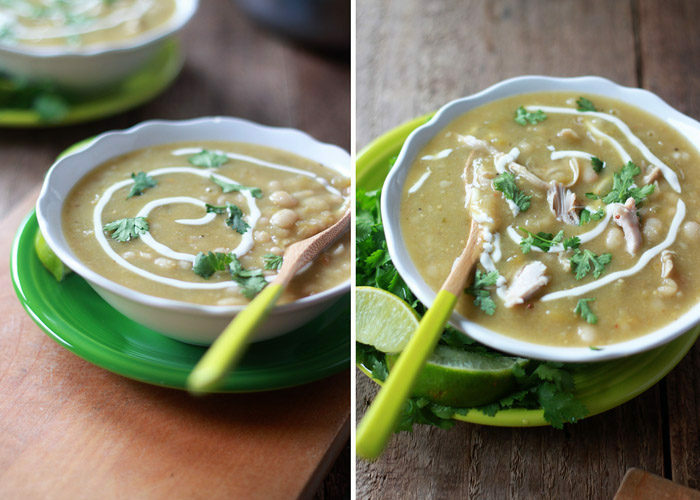 Spicy Chili Verde with White Beans (and optional chicken) – An incredible chili made with tomatillos (so good)! Just add chicken for the carnivores. Butternut Squash & Beer Chili (with optional ground turkey) – This comforting chili is flavorful and hearty with or without the turkey. We love this chili over a generous scoop of brown rice. Slow Cooker Three-Bean Vegetarian Chili (with optional ground beef) – A traditional chili recipe that’s extra easy and totally hearty whether you add the ground beef or not. Slow Cooker Black Bean & Mango Caribbean Chili (with optional pork or chicken) – Black beans and mangoes are a match made in heaven, and in chili? Unbelievably delicious. Try it! White Chili (with optional chicken) – This unique chili has a surprise ingredient that gives it a warm, interesting vibe. Chili Cheese Stuffed Spaghetti Squash – Try your chili leftovers scooped into individual squash shells! The individual servings make for easy customization; plus, it’s just darn tasty served up this way. Acorn Squash, Beet, and Sweet Potato Chili from Farm Fresh Feasts – for those that say beans in chili is blasphemy, this bean-free chili for vegans or with beef for carnivores should fit the bill just fine. 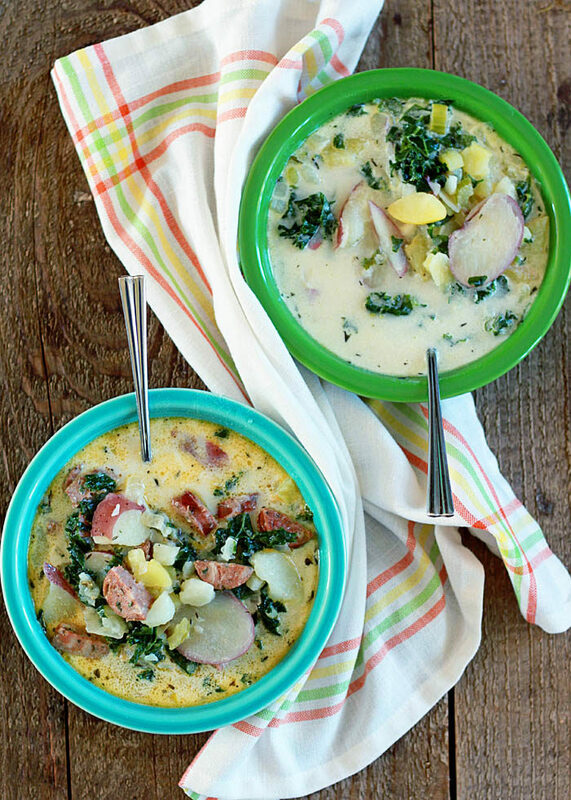 Creamy Potato & Kale Soup (with optional sausage) – A comforting winter soup that’s equally hearty with sausage or without. Hearty Tuscan Bean Stew (with optional chicken) – This sort of reminds me of a modern take on the lima beans and ham I was served often as a kid. Love this stuff! Vegetarian Pho from Scratch (with optional beef) – This homemade pho recipe starts with a flavorful veggie broth. This one is especially easy for mixed-diet dinners because the super thin-sliced meat cooks right in the bowl after you scoop the broth over it! Potato, Beet, & Leek Soup from Farm Fresh Feasts – With three easy “bus stops,” this recipe can be made to suit vegans, vegetarians, and omnivores. Love. Score one more for individually served-up food! Sandwiches are so easy and, of course, endlessly customizable. Hamburgers/Veggie Burgers – Okay, so this one is from the Obvious Files, but still worth mentioning because hamburgers/veggie burgers are quite possibly THE easiest meal for multi-vore homes. They’re a once-per-week occurrence for us as soon as we roll out the BBQ come spring. Bratwursts/Field Roast – This combo is also on permanent rotation for us every summer. Roasted Red Pepper, Arugula, & Goat Cheese Sandwiches (with optional bacon) – A decadent yet simple sandwich. A bit of chicken might also do well for the meat-eaters. Grilled Summer Vegetable Sandwiches with Pesto (and optional chicken) – I’ll be honest, my guy actually preferred this one without the meat (which does sometimes happen). But it’s an option! Chinese Cabbage & Chicken Roll-Ups from Farm Fresh Feasts – because they’re made individually with separately cooked chicken, these are perfect for the multivore family. Roasted Spinach & Garlic White Pizza (with optional chicken) – This cheesy white pizza has tons of roasted garlic. No vampires in sight! Gorgonzola Kale & Pear Pizza (with optional bacon) – Kale on pizza makes such a tasty topping. I love the unusual addition of pears; my guy loves the not-as-unusual addition of bacon. 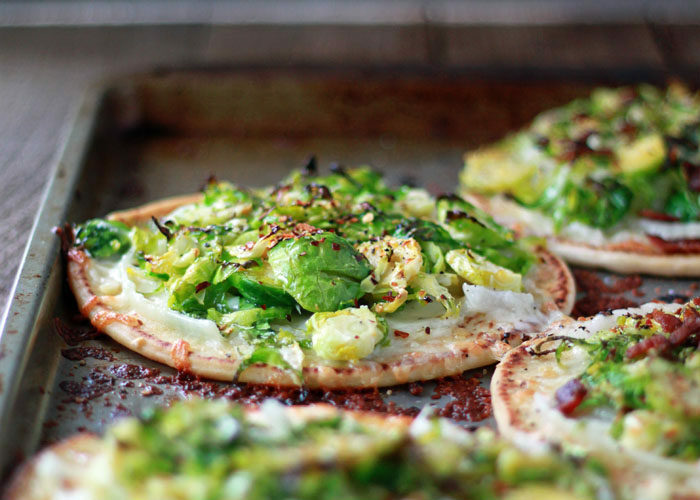 Brussels Sprouts Pita Pizza (with optional bacon) – With the crusts already made, these cute little pizzas are a snap to make. BBQ Chicken/Tofu Pizza – This one is a little labor intensive but SO WORTH IT. A Valentine’s Pizza To Show Your Love from Farm Fresh Feasts – Complete with dazzling pink crust (thanks to beets – brilliant!) and some thoughts on cooking in a multivore kitchen. Quick & Easy Grilled Pizza from Two Healthy Kitchens – One big pizza divided into “safe zones,” customized to each individual’s liking. Mini Deep Dish Pizzas + Dessert from Two Healthy Kitchens – Tiny deep-dish pizzas made individually means each can be customized! No meat, some meat, lots of meat, one olive, 10 olives, veggies galore … make ’em your own! Plus, bake up a few dessert pizzas alongside and you’re good to go for dessert, too. Love this idea. Many Tex-Mex dishes are served up individually – usually in tortillas. Perfect for mixed-diet families! Refried Bean & Cheese Burritos (with optional chicken) – Freezer-friendly and individually made. Life is so much easier when our freezer is stocked with these. Beans & Greens Tacos (with optional chicken) – These tacos whip up super fast and taste divine. Chicken adds a meaty touch for the carnivores. Grilled Tofu Tacos with Sweet Onion Slaw (and optional chicken) – The tofu and the chicken can be grilled up at the same time (we keep a segregated grill around here), which makes these delicious tacos come together super quickly. Grilled Peach Fontina Quesadillas (with optional chicken) – Peaches and fontina are a heady combo; perfect during the summer months when juicy peaches are at their peak. Taco Salads – With an easy trick for individual taco shell bowls, it’s easy to dish up a customized salad for each of you. Arepas Rellenas with Black Beans or Shredded Chicken from The Wimpy Vegetarian – Homemade corn-based bread stuffed with either beans or chicken and served up individually. 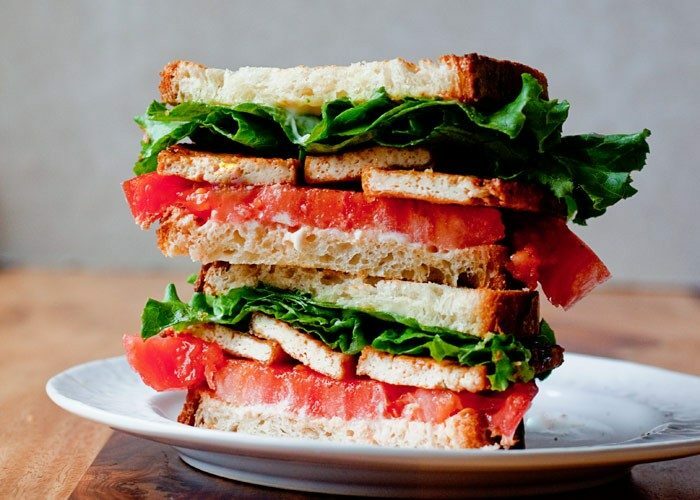 Mouth-watering! Veggie Fajitas (with optional shrimp, chicken, or steak) from The Live-In Kitchen – Easily customizable in nearly endless ways. Love fajitas! And last but not least: Bowls! Grain bowls! These satisfying bad boys hardy need a recipe (here’s how to build one any which way) – but here are three ideas to get you started. 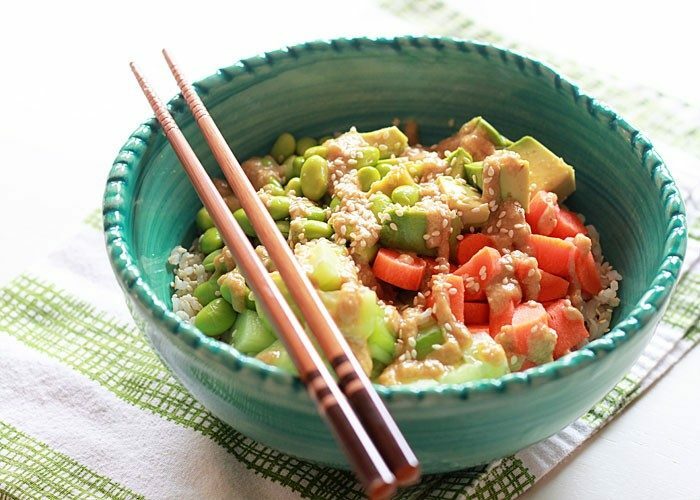 Veggie Roll Sushi Bowl with Sesame-Wasabi Dressing (and optional chicken) – No bamboo rolling mats required! We love these simple bowls. Perfect with a bit of cooked, chopped chicken for the meat-eater. A hunk of salmon might do nicely too! Mojito Chicken Quinoa Bowls from Food Faith Fitness – There’s much more going on in these bowls than just chicken. Like pineapple. And avocado. And macadamia nuts. Just add the chicken to the carnivores’ portions and leave it off otherwise. It’s a complete meal either way. Roasted Vegetable Teriyaki Bowls from The Roasted Root – Super simple yet satisfying. Just add chicken for the meat-eaters! That’s all I have here! What are your go-to recipes for your mixed-diet family? Leave a link in the comments below! Is it just me, or is the link for the roasted vegetable teriyaki bowls wrong? I keep getting directed to grilled tofu tacos. 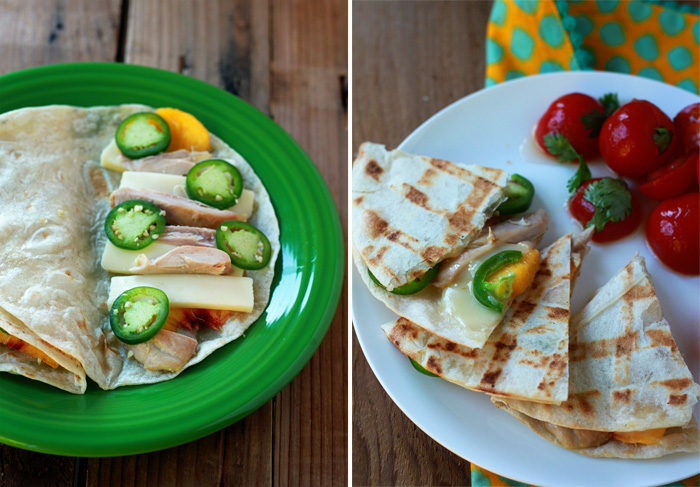 Thanks so much for including my recipes in your round up! My spouse is vegetarian-while-deployed, and perhaps this time he will continue eating meatless after he returns. We’ll see. (Previous deployments he has come back and resumed an omnivore diet.) Either way, I am delighted to have a such a great resource for many inclusive meals. Thanks Karen Raye for sharing these delicious Vegetable recipe, theses looks awesome. I’m glad that I found this post. Once again thanks for your recipes. Your household’s food preferences sound a lot like mine. Thanks for this! It will help in my constant quest for efficient meal planning. If you ever need help, try looking into Japanese recipes! That was a huge turning point for me, as I had plenty of vegetables that my family would enjoy and the meat could often be left out of my portion without ill effects. Most recipes I use either already have mushrooms or the sauces can have some used for meat and some used for tofu, which is very helpful. Justonecookbook.com is one of my favourite resources, especially since a lot of her recipes are able to be made in bulk and I can use the leftovers for lunches. Love your recipes! I’m a Family Lifestyle and Food Blogger in the exact same situation as you, I’m a vegetarian and my husband (and kids) are carnivores. It’s so fun to stumble upon your website given we are in the same situation. I love to cook and create recipes myself. If you ever want to collaborate, I’d love to! Your recipes look delicious! I’ve learned to be very flexible with my cooking to try and accomodate all dietary styles in my family. I made it at home and find your recipe very easy and the dish were so yummy. Thank you for sharing such a wonderful recipe. I loved these cakes. Please bring some more vegan recipes.